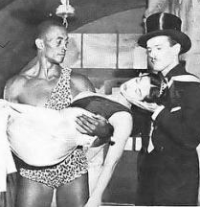 In 1954, a 30 minutes (26 minutes without commercials) unaired black and white tv pilot was filmed, shot partly at the NBC’s studios in New York and partly on location in Bermuda. The tv pilot is based on Lee Falk's comic strip "Mandrake the Magician". Herald Television (jointly owned by ABC and John Cibbs) was to produce the show but the firm (Atlantic Production ?) Herald had hired to produce the show in Bermuda had some financial problems. 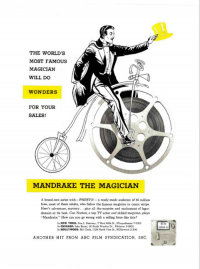 ABC-TV was to take on distribution and financing,  but about October 1955 a new procucing firm was named in the ads for the Mandrake the Magician show, Bermuda Productions. Will Jason signed to direct a series of 26 "Mandrake the Magician" tele-films, but after the pilot no further episodes were made and the project of a regular series was finally dropped. Mandrake (Coe Norton) has a gig at the Parakeet Club. His last illusion is the Vanishing Princess. Backstage when Narda (Lisa Howard) starts to crawl out of a box she’s kidnapped. When she’s missing Mandrake thinks she went back to the hotel. Then he gets a call from the kidnappers. He’s given an address and told to come alone. Lothar (Woody Strode) goes most of the way with him. When he gets there he’s told by Mr.Brown that his group is looking for secret agent Edwards. He’s got some information they don’t want to get off Mordica Island. In the cellar is Edwards aide Wilson. Narda is also being held there. Wilson won’t talk so Mandrake is told to hypnotize him into telling Edward’s location. He says a sub is coming to pick them up and he gives the location of the cave where they’ll be met. Mr.Brown doesn’t keep his word and tells Mandrake he and Narda are staying put. Sound stage organized in specially converted old flying boat hangars on Darrell’s Island, Bermuda. This page was last edited on 27 October 2018, at 15:19.